It's My Year is a part of the new Miss Universe collection, something that just hit the stores recently here in Canada! I was REALLY excited for IMY, as I missed my chance to get Rally Pretty Pink and this seems to be the same thing, just with a purple base instead of pink. On the first glance, it's a shimmery dusty purple in the bottle with a bit of gold duocrome. On the nail, it's got shiny, almost a mirror-like finish. IMY is a gold foil in a purple base, the gold REALLY shows in the light, but it looks more brown in the shadow. 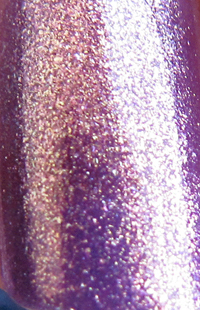 Indoors, the purple base comes through strongly and shimmer is visible. Applies VERY smooth, shows well in 2 coats, but I usually do 3 for full color payoff. I'm also wearing Seche Vite on top. Outdoors, IMY is very reflective in the sun (I had issues photographing it, since it was reflecting my blue shirt too much) and every shimmer particle just glows from within. This is probably my favorite foil I picked up this fall and I find it to be very fall-appropriate since it combines a subdued purple and a whole lotta bling to spice it up. It's a very fun color! I expected it to be more muted, but the color is more than enough. Love it!